In case you didn't know, Quora is a very underutilized sales machine, or at least we think so. I've written one blog post, and an entire ebook on all the potential Quora has to offer to us as sales prospectors. With that said, I'd like to share with you one of the several techniques you can utilize on Quora for your prospecting efforts. It's quick, it's easy, and it'll get you some of the highest quality prospects you could ask for! To effectively use Quora, I first suggest you post high quality content to many of the Quora boards specific to your target audience. Without high quality content in the answers sections of questions, this one technique will be far from useful! My suggestion to circumvent this problem if you feel you're not up to snuff as a writer, is to quickly scrape bits of content from your company blog and add them to the questions. Easily send and easily done. Just be sure to format it correctly to provide an asnwer that's appropriate to the context of the question. Now that you've sprinkled content throughout Quora boards specific to your company's industry, it's time to start utilzing this awesome sales trick: reaching out to those who upvoted your answer. While it seems simple and silly, it's really a great trick. Essentially the user has flagged themselves as particularly interested in what you have to say about that subject matter (think of it as a star or retweet on twitter). Why not engage them to test their interest in your product further. 1. 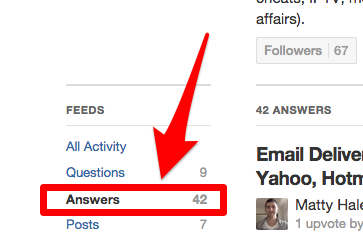 Click into your Quora user Profile and locate the Answers link. 2. Scroll through your answers until you find one with a lot of upvotes. 3. Click on the answer to get the view of all the names of the people who upvoted your answer. Note: You'll have to click into each user one-by-one. And that's it! A simple and tried method that should have your sales efforts on Quora up and running in no time! I just have one question: how many leads did it get for you?